“All-in-One” wireless system with a simple connection over a computer’s USB port. The CaptiFi Long Range Wifi Antenna Solution works with Windows, MAC OS X and Linux. Plug it into your USB port, install the software one time, connect to the internet, and enjoy ultra long range wireless at a blazing fast 150 MBPS! It’s that simple. The CaptiFi has been the best single antenna developed for travel and work, period. RadioLabs, ever pushing the Wi-Fi envelope, has developed a simple and solid solution to the never-ending WiFi range problem. 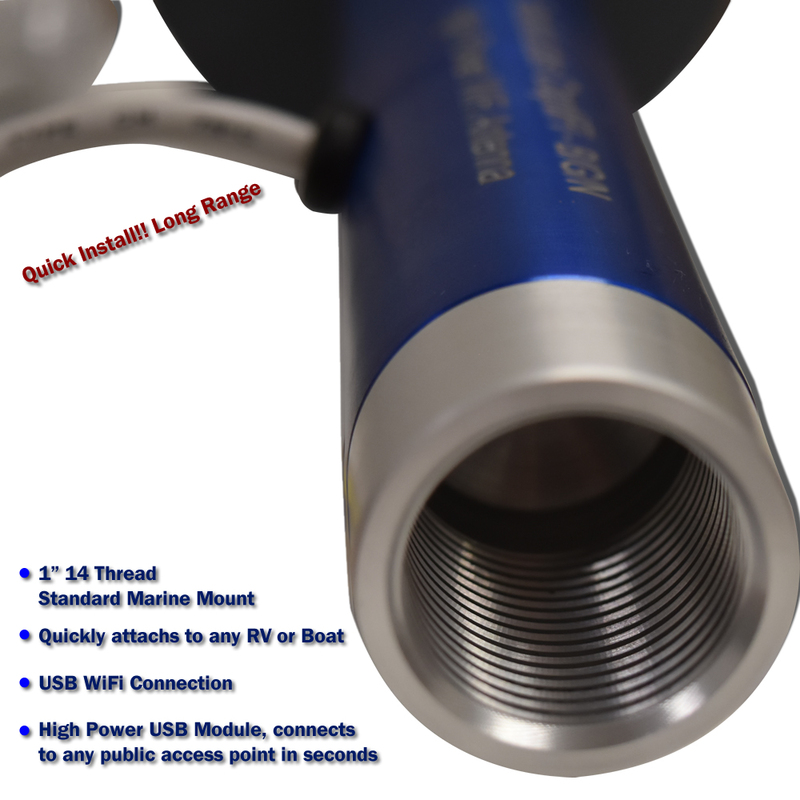 This is especially prevalent in the marine and RV community and in response to demand for a small high power receiver, we have developed the CaptiFi, the ultimate one piece Wifi solution. This unit is designed to provide long range Wi-Fi with a completely weather-proof and easy-to-use antenna with a smaller than ever physical footprint, as a result it has been proven to be the top WiFi Solution choice. NOTE: The video above is 6 years old, and we are currently working hard in production of a large video series on the CaptiFi antenna. 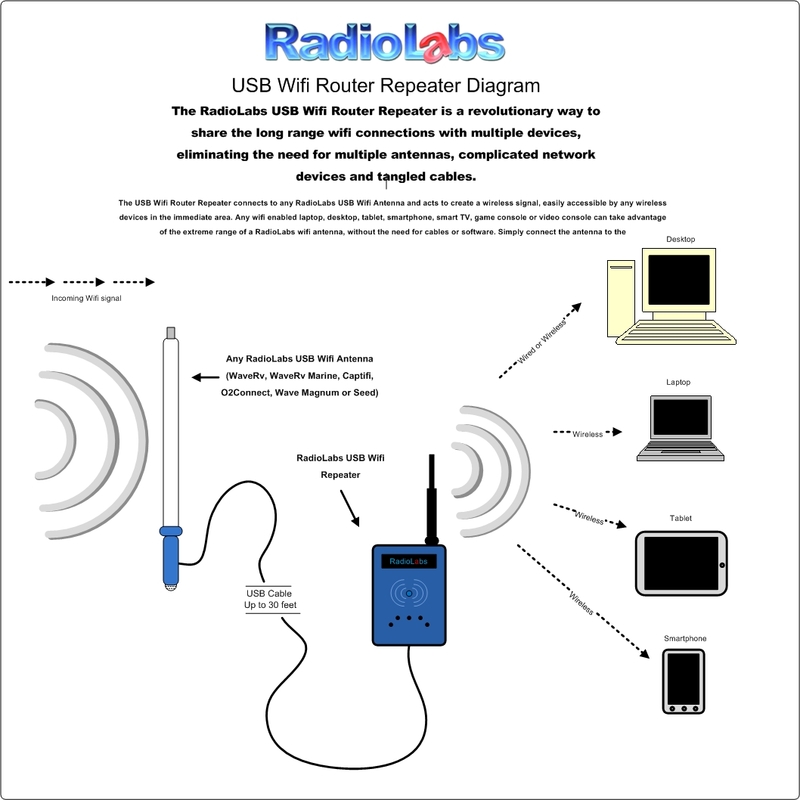 RadioLabs antennas. When the video is viewed on computer, there are annotations where corrections for specifications have changed. The antenna is B/G/N, 150mbps, compatible with ALL USB 2.0 and 3.0 ports, and operates on all operating systems and RadioLabs amazing WiJacker, USB Travel repeater. With the CaptiFi and the WiJacker combination, you can connect to any public access point anywhere, and turn your entire RV into it’s own local access point, that the entire famliy can connect to and provide wifi to all your devices! Look for our new video coming soon, and follow us on Facebook for instant updates! Extremely simple to connect– The CaptiFi is virtually a plug-and-play setup. With no additional equipment needed, just mount the antenna, install the included software, and plug the USB connector into your PC. You will see the difference in range and reception immediately. How far will my WiFi Go? This is the most common question we get regarding the CaptiFi antenna, as well as all the antennas at RadioLabs. The CaptiFi’s unique, record setting antenna design, is the highest gain antenna element ever made, for reaching out to new record breaking distances. Never before has an antenna element been designed with so much gain for it’s physical size. The CaptiFi antenna element has an amazing 9dB gain, and for the small 2 inch x 2-1/2 inch physical size, never before has such a small antenna element been designed that has so much omni directional gain, and able to reach so far. The CaptiFi antenna element, along with the powerful receiver in our USB / WiFi module pair to create a powerful, highly tuned WiFi system, capable of easily reaching out 1-2 miles or more, and we have constant reports of our customers connecting to distant access points in rural locations, up to 5-7 miles or more. One report of a connection up to 10 miles was reported to our customer support staff. So, like all companies, we have to throw a theoretical maximum guaranteed distance on our antennas, and our specifications state 1-mile. If we posted we guarantee it will connect to any access point 7 miles line of sight, we would have a lot of complaints. We can only base our specs off of our testing in realistic scenarios we have physically tested at RadioLabs, and for us, we have physically connected at 1-mile, line of sight, to a regular access point in a realistic scenario. Using RadioLabs’ Wireless USB Utility (available from the included software CD), you can actively view your signal strength percentage, link quality and with a single click, all other available networks in range. This user-friendly interface allows you to save the hotspots/access points you have connected to, making password protected connections easier than ever. This mature design, is extremely rugged and weatherproof, powerful, FAST, easy to install. Just like fine wine, we have improved it with age. This tried and tested design, was originally adopted from a custom RadioLabs proprietary high power antenna element, was originally designed for US Military use, where an almost impossible high gain signal was desired in areas which no traditional antenna was capable of operating. We designed and produced the element alone, in large quantities. Once that project was finished, we had no other immediate use for this high power antenna, so, we put it inside the CaptiFi to let our customers enjoy this fabulous high gain antenna and simple high power module which is known worldwide for it’s tremendous gain, high reliability and effortless connection paired with our repeater system or simply installing the driver. For the price, no other wifi system on the market even compares to the power, versatility and range of the CaptiFi USB WiFi Antenna. 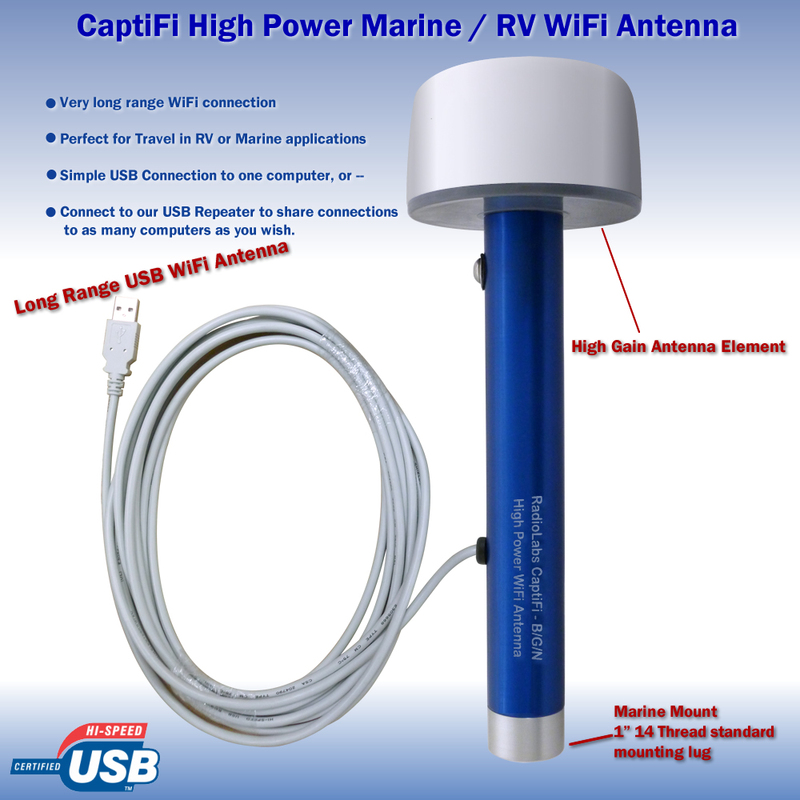 The Captifi antennas, while primarily used by our RV and Marine customers looking to improve their WiFi system, but other companies have used the CaptiFi antennas, for a number of uses we never dreamed of. The CaptiFi antenna has been so reliable, they are actually used by elevator companies, to attach to the top of the elevator car, sending both control, plus emergency backup data to the emergency phone and data link. They have been used in wide-spread applications in the medical industry, to send and receive very secure data and information regarding the patient for medical charts. The have been used in large scale applications for transmitting medical images from CAT scan and MRI, as well as XRays from the imaging centers, to mobile medical carts with ultra long range, and highly reliable communications to the hospital’s wifi and data center. They have been used on mobile robotics for some of the largest manufacturers in the food industry and we have had several large scale customers order them from different food industries for warehouse tracking and reliable scan codes. Security industry loves our compact design and ultra efficient USB connection, as they have been used in numerous applications where other WiFi equipment simply didn’t have the range, or consumed more power, but the highly reliable CaptiFi antenna element, along with our high power, ultra efficient USB Module, surprises even industry veterans, because no other WiFi antenna of it’s size, has so much range and flexibility. The CaptiFi Long Range Wifi Solution makes high speed access not only extremely easy to get, but readily available from the comfort of your boat, recreational vehicle, trailer, car, anywhere you need a stable wireless signal. No external power is needed, as the CaptiFi Wifi Antenna is powered directly from the USB port! At only 9 1/2 inches (241mm) tall, this antenna combines the power and range of antennas and wireless receivers twice the size into a compact one piece unit. The powerful wireless card in addition to our proprietary 8dB omni antenna gives the CaptiFi an amazing performance boost, due this revolutionary antenna element, originally designed by RadioLabs for military applications, increases the performance of the CaptiFi antenna by 20% over antennas of similar size. With both the receiver and the antenna built into a sturdy weatherproof assembly with sealed cable connections and a heavy duty anodized aluminum electronic housing, as a result the CaptiFi will provide long range wireless connectivity for years to come. The CaptiFi Long Range Wifi Solution is proudly made in the USA. We keep production of these close to our location so that we can ensure they meet our strict quality standards. The CaptiFi antenna’s popular chipset is used widespread throughout the industry. RadioLabs paired up with the manufacturer of the wireless chipset we use, years ago, and while we continue to supply drivers online, for all of the operating systems, our drivers are now included in Microsoft Windows’ online automatic installer. For more information on this, and other RadioLabs products, go to our knowledge base. Works on ALL operating systems, even phones, tablets.. with use of our USB WiFi Repeater! Note: Drivers are compatible with Windows 98SE, ME/2K, XP, Vista and Windows 7 (32 & 64-bit) Windows 8 and Windows 10. The CaptiFi is an extremely versatile antenna for long range connections. It’s compact size and weatherproof design means it will fit almost anywhere. Easily portable, the threaded base allows easy removal and relocation with no clamps or bolts necessary. But other 8dB Wifi Antennas i’ve seen are 20 or 30 inches long, why is this one so small? Are you guys pumping up your specs? Does it work as well as other 8dB antennas? To install drivers for your device, especially if it’s a few years old, you have a couple of options. For Windows OS (XP, 7, 8, etc.) you can proceed to the device manager and locate the device (it must be connected to the machine; if you aren’t sure which device is your antenna simply remove the adapter and the device manager will refresh. You should see the unit disappear- plug it back in and it will reappear. That’s of course if it’s still functioning). Once the device is located, right click on it and select properties; some of the newer operating systems will auto-install drivers once a unit is connected. If the status states “Your device is working properly” then your unit’s drivers are properly installed. If you receive a message stating otherwise then select the “Driver” tab from the properties window and then select “Update Driver.” At this time Windows will search the web for the appropriate drivers for your device. You will need an internet connection for this method. The other alternative would be to search the web for drivers for your device. In order to do this you must first identify which network adapter your unit is using. This can be done by plugging it into a device that has drivers installed and then proceeding to the device manager. Here you should find the information you need. If your unit is out of warranty we do offer a service here at the shop where you can send in your device and upgrade it to our current generation of adapter. This applies to our USB external adapters, but may also apply to your Wave Plus for example. You can call anytime and one of our techs will see if your device qualifies for an upgrade, but we no longer support units that are outside of the one year warranty period. Furthermore, we technically can’t be responsible every time an individual makes changes when it comes to their network equipment and computers. If you are using an Apple OS your options are even more limited, as you will need to identify your adapter and then search the web for the drivers for your current version of the Mac OS.